Indian team's skipper Virat Kohli and his better half Anushka Sharma have once again grabbed the limelight. The High Commission of India in London hosted the Indian team and the Bollywood actress was a part of the gathering. There were reports earlier that BCCI had asked the cricketers to make do without their family or close ones for the Test series against England. “We’ve had four days of rest before settling down for the serious task ahead. The players had moved out with spouses, friends, and relatives and on Monday we will leave for Chelmsford,” a source close to the Indian Cricket Team had told the Mumbai Mirror. However, the Twitterati, after spotting Anushka in the team photo, lashed out at BCCI for the same. 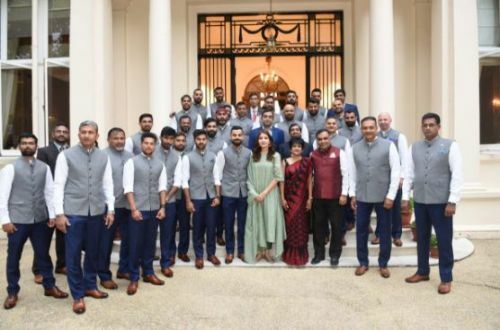 While some pointed out how the vice-captain Ajinkya Rahane stood in the last row for the picture while Anushka posed in the front, some chose to ignore it stating cricketers have life outside cricket. One Twitter user went on to point out that wives of all players accompanied them to the High Commission of India in South Africa, therefore, an issue shouldn't be made out of this one-off incident. They have a life outside cricket. You have to understand that. Wives are invited with the players. for high commission dinner in South Africa, wives of all the players accompanied them. and why everyone’s else wife isn’t there? Team India is set to face England in the second Test of the five-match series which starts tomorrow at Lord's. Virat Kohli and his men would aim at equalling the series, trying to repeat their heroics at the Mecca of Cricket four years ago. For that, however, Kohli would need his most trusted batsmen in Murali Vijay and Ajinkya Rahane to deliver the goods. As far as the bowling department is concerned, things look more or less settled. One change that the team management might decide to make would be drafting in Kuldeep Yadav for Umesh Yadav as the Edgbaston pitch was conducive for spin bowling and Lord's wicket might be similar.